At A&A Coatings, we design bio-active or bio-compatible thermal spray coatings that can be applied on medical devices such as prosthetic implants devised for people with injuries or those who are suffering from physical deformities. We count it as one of our key responsibilities to aid pharmaceutical and medical processing industry players with our thermal sprayed technologies. A&A Coatings uses a rich variety of thermal spray powders, including but not limited to pure titanium, which is commonly used to coat implants. 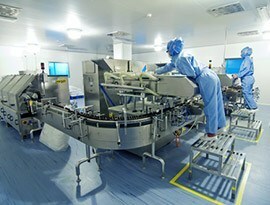 The medical products packaging industry deals with medical tools, devices and components that are usually confined in multilayered breathable polyfilms. Many medical devices are sterilized and packaged in separate facilities through a specific process (Medical Device Impulse Pouch Sealing). Years of research has led to the development of a proprietary coating material, Cerami-Pak®, which is specifically developed for the packaging industry. Medical devices are a large family of instruments, implants, apparatus and many other articles that are commonly used in the diagnosis, treatment and prognosis of diseases. Our specialized thermal spray coating and spraying of biomedical implants solutions are devised with an aim to form porous coatings that will be fully bio-compatible with and have a special bond to human tissue. We strongly recommend Air Plasma Coatings, Vacuum Arc Spray Coatings and Vacuum Plasma Coatings for medical devices. Medicines that are available at retail stores are defined as over the counter medicines. Usually, heat shrink tunnels are used to encapsulate medicines. An L-bar sealer is used for accomplishing the heat seal, whereas a belt is used for taking the product to the heated chamber. We apply thermal spray technologies to allow the seamless closure of the thermo-formed plastics. A&A Coatings has served the pharmaceutical and medical processing industry for more than 70 years and has established our identity as one of the most trusted names for thermal spraying in this industry. With the strong expertise of our materials engineers and spray technicians combined with our competitive pricing and quick turnaround time, it is easy to understand why many pharmaceutical and medical processing firms have chosen to work with us for thermal spraying their products. Do contact us today to learn more about our specialty coating solutions.